Senior Morgan Johnson and the No. 8 Texas volleyball team celebrated their third straight victory, a straight-set road sweep of Iowa State (photo courtesy of texassports.com). AMES, Iowa — Micaya White and Logan Eggleston registered 12 kills apiece, and Sydney Petersen and Autumn Rounsaville notched 16 and 10 digs, respectively, to lead the No. 8 Texas volleyball team to a 3-0 (25-19, 25-19, 25-14) sweep over Iowa State. The victory improved UT’s record to 13-4 overall, and 8-1 in matches against Big 12 teams; Iowa State fell to 11-11 overall, and 4-5 in conference play. Texas extended its winning streak to three consecutive matches, while ending the Cyclones’ streak of three consecutive victories. 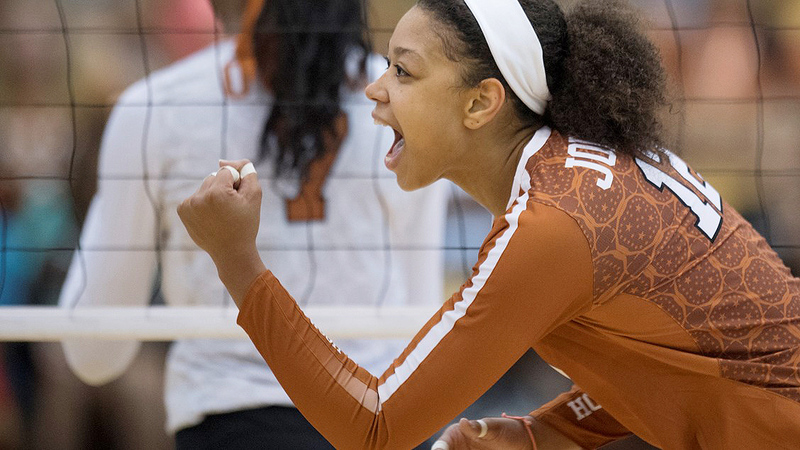 As usual, Ashley Shook steered the Texas offense, handing out 31 assists. Brionne Butler and White led the UT defense with five and four blocks, respectively. Texas dominated from start to finish, outhitting the Cyclones, .364 to .129. After winning the first two sets, the Longhorns put the match away in the third. Thanks in large part to Eggleston, who reeled off five straight service points to push her team out to a comfortable 7-1 lead. Texas now returns home to host Oklahoma at 3 p.m. Saturday. The Longhorns will try to complete the season sweep of the Sooners after beating OU Oct. 13 in Norman, Okla. Saturday’s match can be seen on the Longhorn Network.